The Nashville Sounds finished the 2018 season with a 72-68 record, good for second place in the American Southern Division. Despite finishing with the sixth-best record in the Pacific Coast League, the Sounds finished 11.0 games behind first place Memphis. Nashville spent 105 days in second place, 42 days in third place, three days in third place and one day in first place. The only day the Sounds spent in first place was after winning at New Orleans on Opening Day to start the season 1-0. 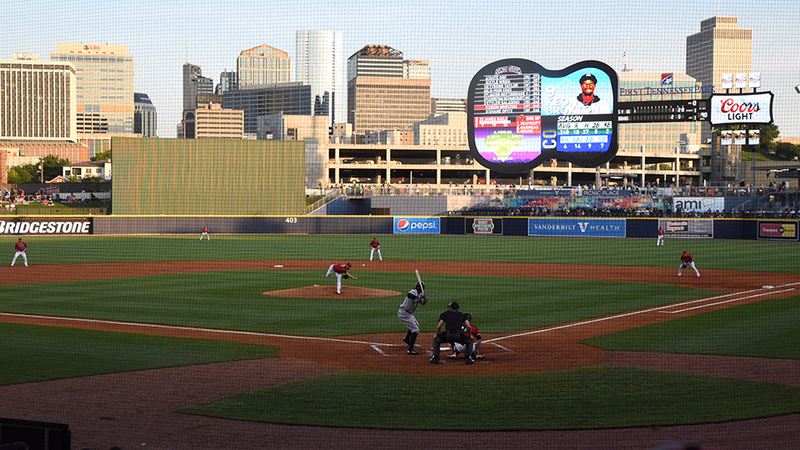 First Tennessee Park welcomed over 600,000 fans for the first time in the ballpark's four-year history. 603,135 fans entered through the gates, giving the Sounds the fourth-highest attendance in Minor League Baseball. The Sounds finished behind only Triple-A Charlotte, Triple-A Indianapolis and Triple-A Round Rock in overall attendance. The 603,135 fans in 2018 was good for second-most in the 41-year history of the Sounds, coming up just short of the franchise record 605,122 set at Greer Stadium in 1990. First Tennessee Park hosted 20 sellouts in 2018 to bring the ballpark's all-time total to 75. A large part of Nashville's success in 2018 came at home as the team finished with a 41-29 record at First Tennessee Park. The mark was the second-best in the Pacific Coast League, behind only Triple-A Fresno's home record of 41-28. The 41-29 record was also the best single-season home attendance in First Tennessee Park history, besting the previous mark of 36-36 set in 2016. The Sounds are now 140-143 at First Tennessee Park. On Friday, August 3, the Sounds notched franchise win number 3,000 with a 6-2 win over the visiting Fresno Grizzlies. At the time of the win over Fresno, 1,485 of the wins came in the Pacific Coast League era. On August 28, the Sounds topped New Orleans, 7-3, to capture the franchise's 1,500th win as a Pacific Coast League member. In the 41-year history of the Nashville Sounds, the team is 3,017-2,849 for a winning percentage of .514. A total of 66 players spent time with the Sounds in 2018, including 40 pitchers and 26 hitters. Five went on to make their Major League debuts straight from Nashville. Lou Trivino, Nick Martini, Ramon Laureano, Jeremy Bleich and Beau Taylor all made their big league debut in 2018. Players who were with the Sounds from start to finish include Raul Alcantara, Eric Jokisch, Steve Lombardozzi, Jorge Mateo, Sheldon Neuse, BJ Boyd and Anthony Garcia. The highlights of the 2018 season came in the form of a 15-game winning streak from July 29 - August 14. The 15-game streak matched a franchise record set in 1999. The streak started with a 9-5 win in Salt Lake on July 29. The Sounds then beat Salt Lake, 11-8, the next night before returning home where they swept a seven-game homestand against Fresno and Sacramento to extend the streak to nine games. The team went on the road and swept a four-game series in Colorado Springs to make it a 13-game winning streak. Back home again, the Sounds won the first two games of a four-game set against Round Rock to extend the streak to 15 games before falling to Round Rock, 3-1, on August 15. During the streak, Nashville outscored their opponents, 89-48, and hit .309 (169-for-548) while the pitching staff recorded a 3.13 ERA (138.0 IP/48 ER). Right-handed pitchers James Naile and Bobby Wahl, along with infielder/outfielder Nick Martini were named Pacific Coast League All-Stars for their play during the first half of the season. Only Naile and Wahl played in the 2018 Triple-A All-Star Game as Martini was called up to Oakland to make his MLB debut. For both Naile and Wahl, it was their first All-Star Game nod in their respective careers. Joining Naile and Wahl in Columbus, Ohio for the All-Star Game was Sounds Athletic Trainer Brad LaRosa and Sounds broadcaster Jeff Hem. James Naile was the lone Sounds player to garner a Pacific Coast League weekly honor in 2018. The right-hander was named PCL Pitcher of the Week for his efforts from April 5-15. Naile started the season on fire with a 3-0 record and 0.00 ERA in his first three starts of the year. In 17 2/3 innings, he allowed 15 hits and two walks while racking up 15 strikeouts. Nick Martini was named the 2018 Team MVP as voted on by the coaching staff and his fellow players. Although the infielder/outfielder played in only 76 games with Nashville, his impact was immediate. Martini hit .297 (82-for-276) with 44 runs scored, 12 doubles, 2 triples, 6 home runs and 40 RBI. He drew 51 walks that contributed to his .406 on-base percentage. One of the highlights of the season was Martini's incredible on-base streak which reached a franchise-record 66 games. Martini also had a 21-game hitting streak from May 22-June 19 in which he hit .378 (34-for-90) with 15 runs scored, 9 extra-base hits and 14 RBI. Martini's on-base streak of 66 games was the longest of the season in professional baseball. Over the 66-game stretch from April 14-September 1, Martini hit .326 (79-for-242) with 40 runs scored, 12 doubles, 2 triples, 6 home runs and 37 RBI. He drew an impressive 44 walks during the streak to lift his on-base percentage to .431 during the stretch. Since MLBAM began tracking on-base streaks in 2009, Martini's 66-game streak is the second-longest in professional baseball. Andrew Velazquez of Single-A South Bend reached in 74 straight games in 2014. From May 22-June 19 he hit safely in 21 straight games, which was the longest hitting streak by a Sounds player in 2018 and the fourth longest by a player in the Pacific Coast League this season. During the 21-game stretch he hit .378 (34-for-90) with 15 runs, 6 doubles, 1 triple, 2 home runs, and 14 RBI. Franklin Barreto was named the team's Fan Favorite choice in 2018 in an online vote. Barreto gave Sounds fan plenty to cheer about by hitting .259 (73-for-282) with 54 runs scored, 16 doubles, 1 triple, 18 home runs and 46 RBI. Barreto also drew 39 walks and stole five bases. In front of the Nashville faithful, Barreto hit .296 (34-for-115) with 16 extra-base hits in 34 games at First Tennessee Park. Four of Barreto's 18 home runs were go-ahead homers and one was a game-tying blast. Eric Jokisch was recognized with the team's Community Service award. The left-handed pitcher took time out of this personal schedule to make multiple trips to Monroe Carell Jr. Children's Hospital at Vanderbilt to visit with patients and their families. Jokisch was also a consistent participant in autograph Sundays and spent his personal time participating in youth baseball clinics at First Tennessee Park. For the second straight season, the Sounds set a franchise single-season strikeout record. In 2017 Nashville batters were fanned 1,217 times and they were punched out 1,222 times in 2018. Sheldon Neuse was the main culprit, accounting for a league-high 172 strikeouts, which also set a new single-season franchise record. Neuse's 172 strikeouts finished tied for 12th in all of MiLB. The other Sounds who struck out over 100 times in 2018 were Jorge Mateo (139), Anthony Garcia (107) and Franklin Barreto (106). Anthony Garcia was a mainstay in the cleanup spot in Nashville's lineup this season and primarily served as the team's designated hitter. The slugger set career-highs in home runs (25) and RBI (91), both of which were team-highs. His 91 RBI led all Oakland farmhands and put him in the top 10 in Sounds single-season history. He made headlines with his eight-RBI game on July 17 against Omaha to set a career-high and a franchise record. He belted a pair of home runs including a grand slam in Nashville's 11-1 win over the Storm Chasers. On the season, Garcia hit .254 (122-for-480) with 78 runs, 31 doubles, 1 triple, 25 home runs and 91 RBI in 131 games. The native of Puerto Rico became the first Sounds player to record 30+ doubles and 20+ home runs in the same season since Taylor Green in 2011. He also became the first Sounds player to lead the team in runs, doubles, home runs, and RBI in the same season since Chris Truby in 2004. It was no secret entering the season that Jorge Mateo boasted blazing speed and he put that on display throughout the 2018 campaign. He tallied 16 triples to break the franchise record, which had stood for 38 years. Duane Walker tripled 15 times in 1979. The last time a Sounds player led their respective league in triples was when Rich Thompson had 13 in 2004. Mateo's 16 triples led all of MiLB. He also swiped 25 bases, which were fifth-most in the PCL and tied with Double-A Midland's Richie Martin for the second-most among Oakland farmhands behind only Givaine Basilia's 26 with the DSL Athletics. With 16 triples, Mateo is now tied with Buck Showalter and Doug Brady for eighth-most all-time in Sounds history. Once again, the Nashville Sounds were named Honorable Mention Team of the Year by Ballpark Digest. The award is given to the team that best delivers a quality product and shows community initiative in a competitive market. First Tennessee Park welcomed over 600,000 fans through the gates in 69 games. Sounds Vice President of Operations Doug Scopel was named Executive of the Year by Ballpark Digest. The 2018 season was Scopel's 19th with the Sounds and oversees stadium operations, baseball operations, media and public relations, retail, finance and security services for the team. He's also the primary interface for officials with Nashville SC, which plays its home games at First Tennessee Park. Outfielder Dustin Fowler was optioned by Oakland to Nashville on August 1 and was activated by the Sounds on August 3. He then went on a tear and spearheaded the Sounds' 15-game winning streak. In 25 games in the month of August, Fowler hit .379 (39-for-103) with 19 runs, 10 doubles, 3 triples, 1 home run and 11 RBI with an on-base percentage of .402. His 39 hits from August 3-31 were tied for fifth in all of MiLB. In 55 games with the Sounds, Fowler batted .341 (78-for-229) with 37 runs, 17 doubles, 6 triples, 4 home runs and 27 RBI. He also swiped 13-of-15 bases in those 55 games, which were the second most on the team. Third baseman Sheldon Neuse got off to a rocky start in 2018 but really turned things around after the All-Star Break. Prior to the Triple-A All-Star Game on July 11, Neuse was batting just .224 (68-for-303) with 26 RBI and sported a .271 on-base percentage and a .317 slugging percentage. The tide turned for Oakland's #10 prospect almost immediately once the All-Star Break wrapped up. He had a career-long 15-game hitting streak from July 16-30 in which he hit .379 (22-for-58) with 12 RBI and 8 runs. In the second half of the season, he hit .321 (63-for-196) with 29 RBI and upped his on-base and slugging percentages to .356 and .418 respectively. The turnstiles to the clubhouse were busy this season for the Sounds as there were 195 roster moves throughout the campaign. On August 31, the Sounds made an unprecedented 16 transactions. 32 of the 66 players who appeared in a Sounds uniform in 2018 also appeared in a Major League uniform, 30 of them for Oakland while Renato Nuñez (Texas and Baltimore) and Bobby Wahl (New York Mets) appeared for other Major League teams. The Sounds received a boost in late May from a prospect with no previous Triple-A experience. Ramón Laureano began the season on the disabled list after breaking a pinky in Spring Training and never made any rehab appearances before being assigned to Nashville on May 21. He immediately made his presence felt as that night he made his debut and went 2-for-2 with a home run, a sacrifice fly, 2 RBI and 2 runs scored. At the plate, Laureano hit .297 (73-for-246) with 44 runs, 12 doubles, 14 home runs, 35 RBI and 11 stolen bases in his time with the Sounds. Oakland's #21 prospect repeatedly showed off his cannon for a right arm as he compiled 13 outfield assists in just 64 games. To put that in perspective, Colorado Springs' Tyrone Taylor led the league in outfield assists with 18 but did so in 115 games. Memphis' Adolis Garcia had the second most with 14 in 104 games. The Sounds had a flair for the dramatic at First Tennessee Park as they collected eight walk-off victories. Nashville walked-off in back-to-back games against the Omaha Storm Chasers on April 15 & 16. Three of the walk-offs came in extra innings. Five of the eight wins came on routine base hits while Boog Powell went the unconventional route with a walk-off bunt single against the Fresno Grizzlies on August 2. The other two walk-off wins came on a wild pitch and a sacrifice fly. Six different players posted 10-game hitting streaks during the 2018 season. Ramón Laureano, Nick Martini, and Sheldon Neuse each had two such streaks while BJ Boyd, Dustin Fowler and Anthony Garcia each had one. Nick Martini's 21-game streak was a team-best and a career-best. Neuse's 15-game stretch was a career-best as well. Boyd's season-long was a 13-gamer, which matched a career-long. The strength of the 2018 Nashville Sounds was the pitching staff. They boasted the third-lowest ERA in the league at 3.96 and issued the fewest walks with just 374. They were in the top five in the league in multiple other categories including WHIP (2nd, 1.31), runs allowed (4th, 625), and home runs allowed (4th, 106). The Sounds used 23 different starting pitchers, which was the most in the Pacific Coast League. Two mainstays in the starting rotation were Eric Jokisch and James Naile. Jokisch made 26 appearances including 23 starts for Nashville while finishing fourth in the league with 148.2 innings pitched and his 4.06 ERA was ninth on the circuit. His 148.2 innings of work were the most by a Sounds pitcher since 2011 when Sam Narron compiled 160.0 innings and Amaury Rivas logged 150.2. A lack of run support for Jokisch played a factor in his 11 losses, which were tied for third-most in the PCL. The Sounds were shut out in his first two starts and scored just 17 runs in his 11 losses and scored more than two runs in those games just twice. Overall, Nashville scored 3.8 runs per game in Jokisch's starts. He tallied 121 strikeouts to lead the team and finish tied for eighth in the PCL. James Naile made 24 starts for the Sounds and accumulated 135.2 innings. Oakland's #29 prospect finished second on the team in wins with seven behind only Dean Kiekhefer's eight. There were 13 different players ranked in Oakland's top 30 prospects in either MLB Pipeline or Baseball America at some point throughout the season that donned a Sounds uniform. Those include Franklin Barreto who began the season as Oakland's top prospect according to MLB Pipeline, and Jesus Luzardo who finished the season ranked as the A's top prospect. Other players in the top 10 of both lists are Sean Murphy, Jorge Mateo and Dustin Fowler. Infielder Steve Lombardozzi tied a Sounds franchise record with nine sacrifice flies in 2018. He became the fourth Sounds player to do so and first since 2002. Nate Chapman (1982), Ivan Cruz (1999), and Mendy Lopez (2002) are the other three players. The nine sacrifice flies by Lombardozzi were second most in the PCL this season behind only Fresno's A.J. Reed who tallied 10.